2000 Island Runner 26 2000 Island Runner 26 cc 2015 Suzuki 300 (2nd owner for 13 yrs) quality..performance..value! 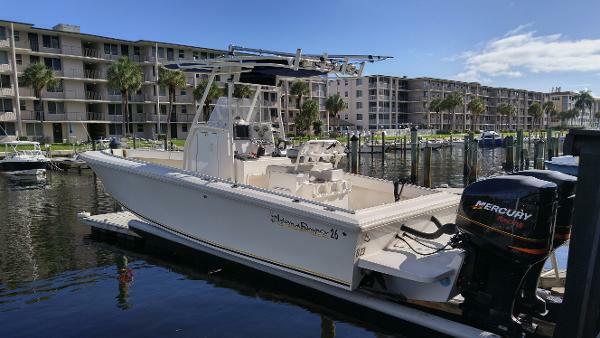 This Island Runner 26 is in excellent condition and has everything you need for adventures offshore, family outings to the cove, or running to the Bahamas for the weekend. 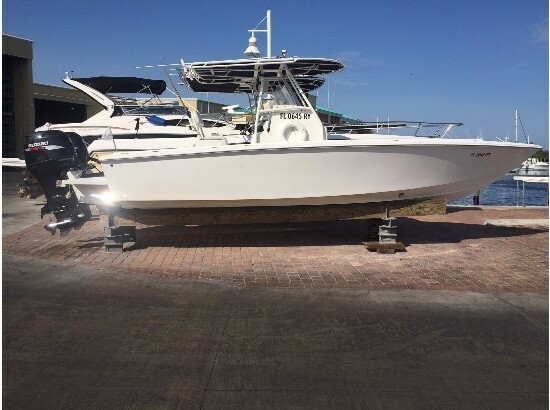 If you are not familiar with these boats, one look and you will quickly realize this is not your typical mass-produced center console fishing boat. This is a high performance, fast, stable, super strong, fishing machine!! Island Runner boats are hand crafted and built one at one time. The 26 is built with a solid foam core construction using 100% hand laid knitted fiberglass. Vacuum bagged core cell composite and lamination give the 26 its unsurpassed strength and dependability. The hull is completely wood-free and has a three piece configuration with a fully molded inner liner. Island runners are designed for maximum speed and efficiency. Beautifully balanced and light weight to slice through seas without requiring massive amounts of power or fuel. Features included: -55 gallon live-well, in-deck -padded bow cushions, -custom bow dodger -rear folding bench seat. -new JL audio stereo and speaker system with amplifier provide a high quality sound -full custom Sunbrella boat cover, -2004 continental tandem axle trailer (new axles, tires, Kodiak --stainless brakes, and tires) -2 Garmin touchscreens with down view and side scan sonar fully -integrated with digital Suzuki controls and nema 2000. -led cockpit lighting and spreaders. -rear custom Sunbrella shade. -dual 2000 gph bilge pumps. -new Bennett trim tab system. -kicker bracket for island trips, -coast guard package and more! -light blue gelcoat hull with white interior. -overall 28'6", beam 8'6",draft 20". Dry weight 3200#, -24 degree deadrise at transom and 60 degree bow entry. -fuel capacity 150 gal. -performance: 2015 Suzuki 300 w/select rotation with dual gauges (200 hrs) 5 years of full warranty left. -cruise speed 37 - 38 mph at 4500rpm (2.8 - 3.1 mpg) WOT 53 mph at 6200 rpm. with Suzuki 3x18.5x16 prop -crazy fuel efficient!! Call with any questions or to schedule a time to see this boat. $59,900.00. 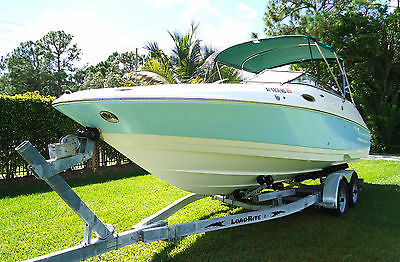 772-205-4197 Boat is located in Fort Pierce, FL SERIOUS BUYERS PLEASE. NO TIRE KICKERS OR BROKERS NEEDED. 2004 Island Runner 26 Beautiful 2004/2015 Island Runner was completely renewed last year. 141 hours on the twin late 2015 Mercury 150 four strokes with a 3 year factory warranty and additional 5 years extended. till 2023 This boat is absolutely the most beautiful Island runner for sale the perfect blue gel coat is like a mirror (as any used boat you will find a few dings in the white gel coat on deck but all are very minor) Features included: -All new interior-55 gallon lighted live-well, in-deck, and massive fish box and in hull storage-storage under helm seat- salt water and fresh water wash done (with 30 gallon tank) -New outriggers poles -18 plus rod holders - top quality eletric reel outlet -4 new Interstate Batteries with on board charger -removable rear folding bench seat. -New Wet sound stereo and speaker system with amplifiers\ bluetooth, provide a high quality sound and two sub woofers-2 Gamins 1 1040sx with 1kw transducer and 1 94 sv with down view and side scan sonar 600watt transducer and new 4k radar -led cockpit lighting ,massive underwater lighting. led spot light -dual rule gold 2000 gph bilge pumps. - trim tab system. 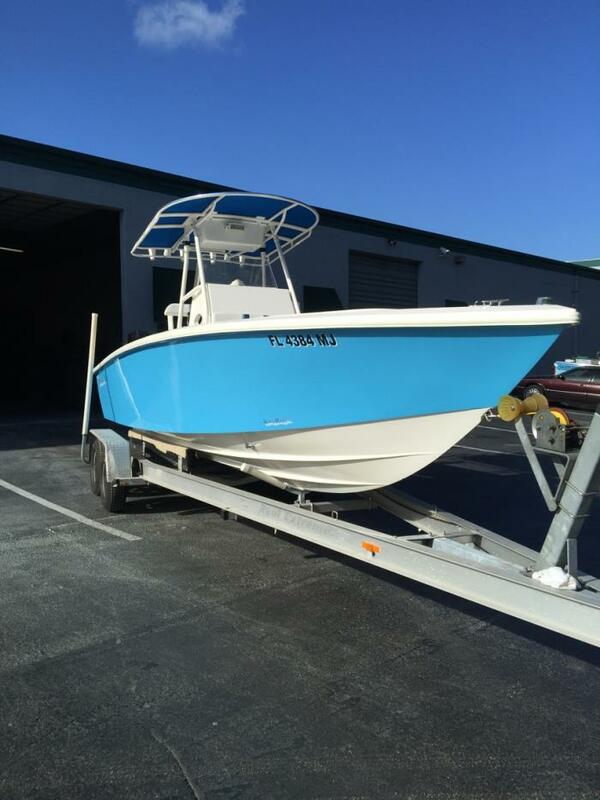 - perfect blue gel coat hull with white interior. -overall 28'6", beam 8'6",draft 20". Dry weight 3200#, -24 degree dead rise at transom and 60 degree bow entry.-fuel capacity 150 gal. 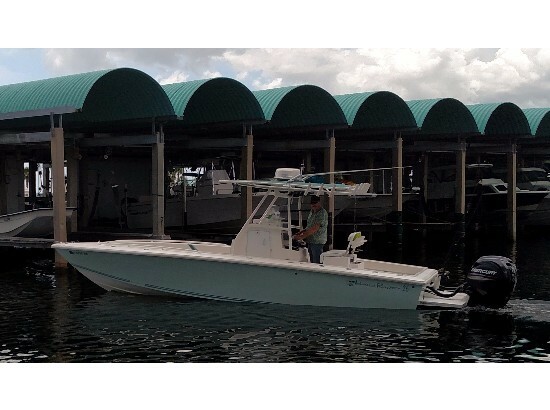 -performance: 2015 Mercury dual 150hp 4 stroke smart gauges (141 hrs) 6 years of full warranty left. -cruise speed 37 - 38 mph at 4500rpm (2.8 - 3.1 mpg) WOT 54 mph at 6200 rpm. -excellent fuel efficient!! 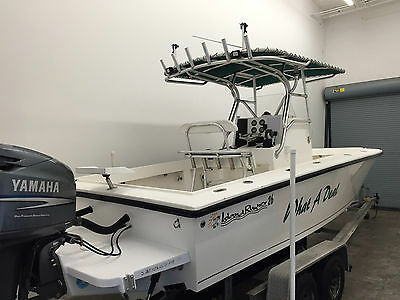 2002 Island Runner 26 Center Console New arrival. One owner, rack stored indoors. Approx 300 hours on twin Mercury 200 HP EFI'S. Boat cover, stereo CD , GPS, Outriggers. Excellent condition. Trailer available but not included in price. 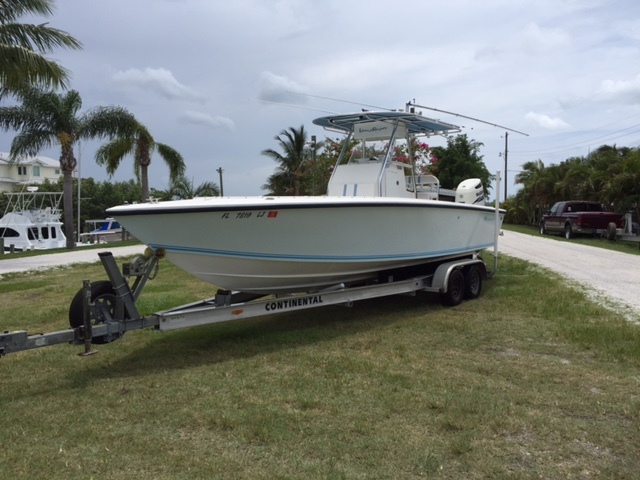 2001 26' Island Runner with Twin Yamaha HPDI 150's with stainless props. Great offshore fishing machine, very fast and stable. Raymarine C80 GPS with Fish/Depth Finder, Custom T-Top with brand new Sunbrella, Hydraulic steering, Stainless Marine Engine bracket, Icom VHF radio, Live well, Large Fish Boxes, Fresh and Salt water wash down (new pumps), Trim Tabs, Dual Batteries, New speakers and West Marine Radio with blue tooth, Yamaha HPDI 150's have 1200 hours since new and only 20hrs on fresh overhauls with warranty by Palm Beach Outboards. Engines run fantastic! Entire oil system cleaned and new filters installed, New aft and forward LED Spreader lights. Boat shows great !! Comes with Rocket Trailer, new axles, lights, jack and bunk brackets just installed. Call Mark @561-254-4120 to schedule an inspection.